Ingrid and I were in the quiet resort town of Fuschlsee in the Austrian Alps. “Quiet” is an understatement; it was completely dead. We kept walking along the lakefront, hoping to find one place open where we could get a cappuccino. We found one resort that was open but wasn’t serving anything. They graciously let us use the bathroom, and gave us directions to another resort that they thought would be open. We walked through the resort to get to where they had pointed us. 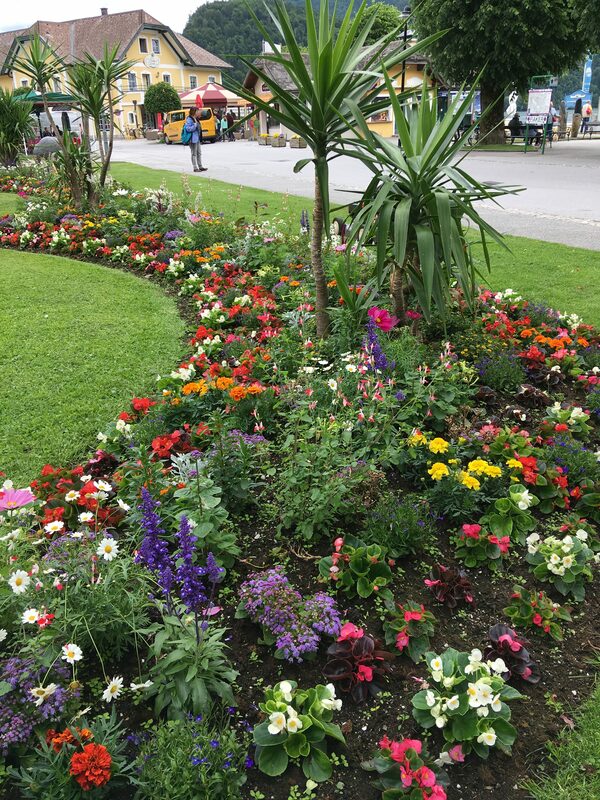 It was sprawling, with multiple restaurants and bars, a spa, gardens, and a game room for kids. It reminded me of one of my travel dreams. One of my favorite writers is Somerset Maugham, and he used to spend weeks at a time in resorts like this in the Swiss Alps. He would sleep late, eat a big breakfast, take a long walk, read the paper, write for a few hours, take a nap, then proceed to happy hour, dinner with fellow sojourners, maybe a spin at the casino or a show, then early to bed—all done among beautiful lakes and mountains. We walked up the foot of the mountain to the other resort and it was shut tight, so we gave up and walked back to the bus stop. This taught me an important lesson: When a Hop On Hop Off ticket seller tells you to only hop off at certain stops, it’s for your own good. The next stop was a scenic overlook where we could all hop off, take a photo, then hop back on and be whisked away to the next stop. When I used to live in Oxford, it was common for tour buses to do this in front of some of the most famous sites, and I sneered at the practice. But hey, in this case there really was nothing to do except take a photo since it was basically a cliff. 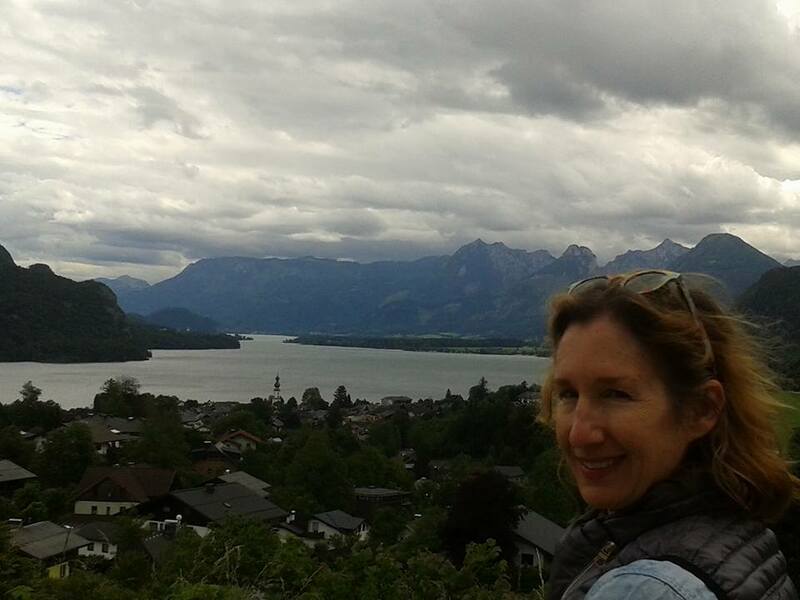 Here I am, overlooking Lake St. Wolfgangsee. Yes, there was a St. Wolfgang, and yes they named a lake and a town after him. The bus took us into the town, where the first thing was saw was gondolas. 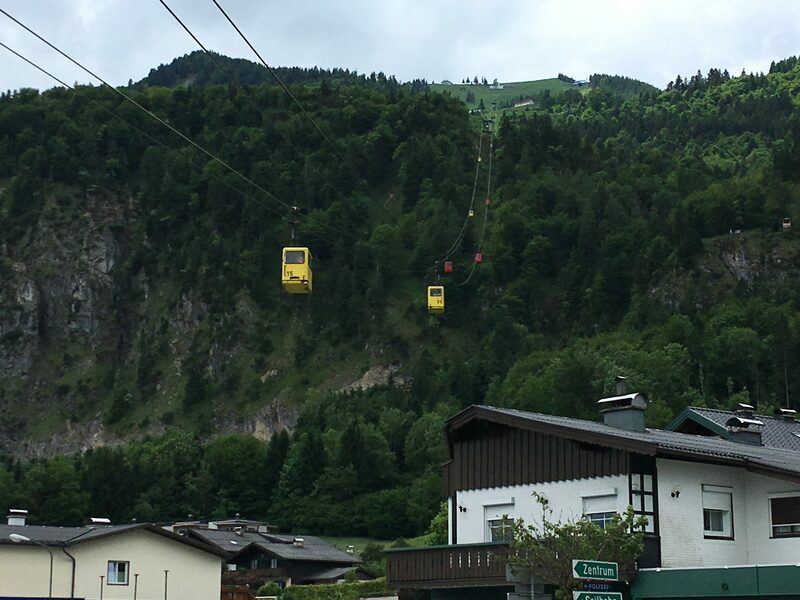 “Do you want to ride one to the top of the mountain?” Ingrid asked. I really didn’t but if she wanted to, I would. “Let’s see how much it costs, and what’s up there,” I suggested, stalling. “Me too—I did it in the Canadian Rockies once and that was enough. We walked down to the lake. The town and the lake were very pretty despite the dreary weather. We found a restaurant called Papagano, which is the name of a character in the Magic Flute, which we would see performed by marionettes that evening. I had ratatouille, and it was the best meal I had in Europe. 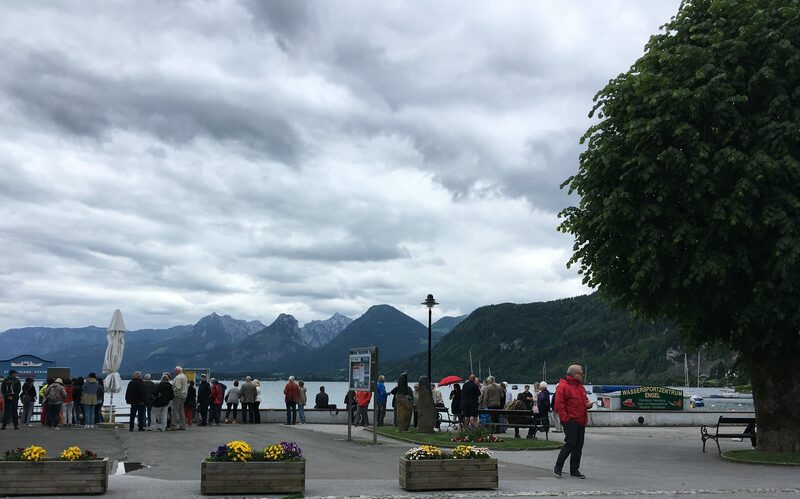 On to the next stop—Mondsee, or Moon Lake. 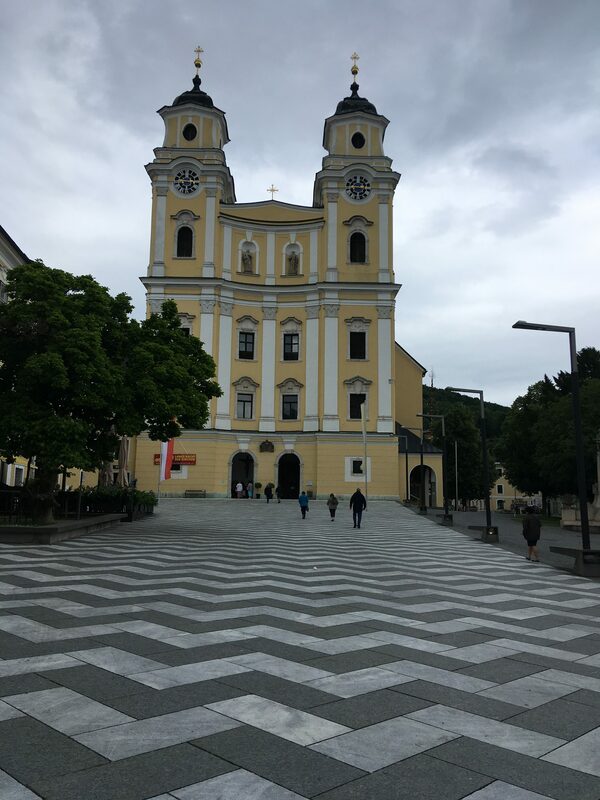 This town was not nearly as pretty as the first two, but the wedding scene from The Sound of Music had been filmed in the basilica there. 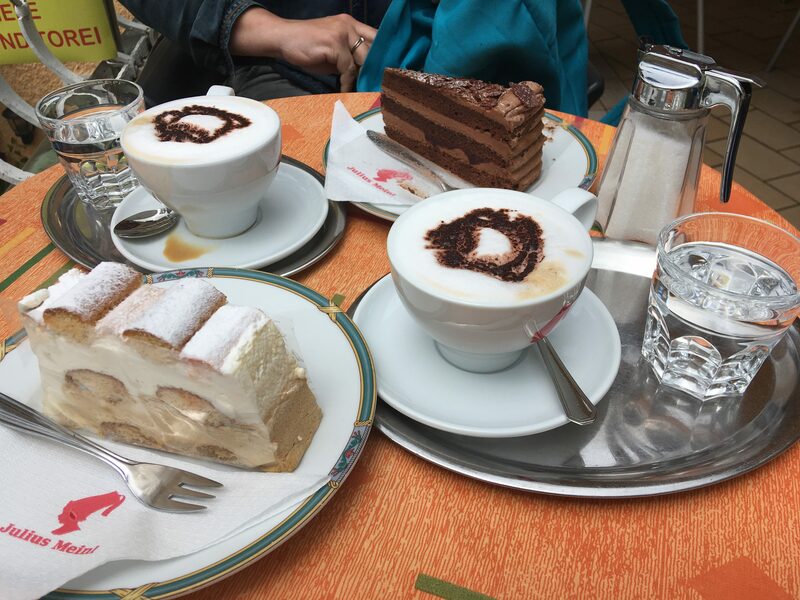 First, we stopped for “a little cake” and the long-anticipated cappuccino—to give us energy. 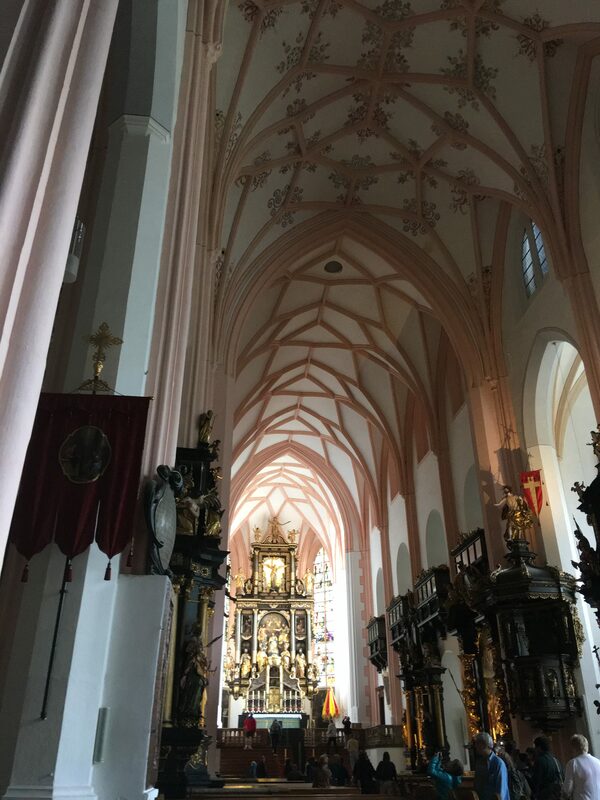 The basilica was beautiful; I could see why they used it for the film. I dropped a coin in the slot and lighted a taper for a friend who had just had surgery. 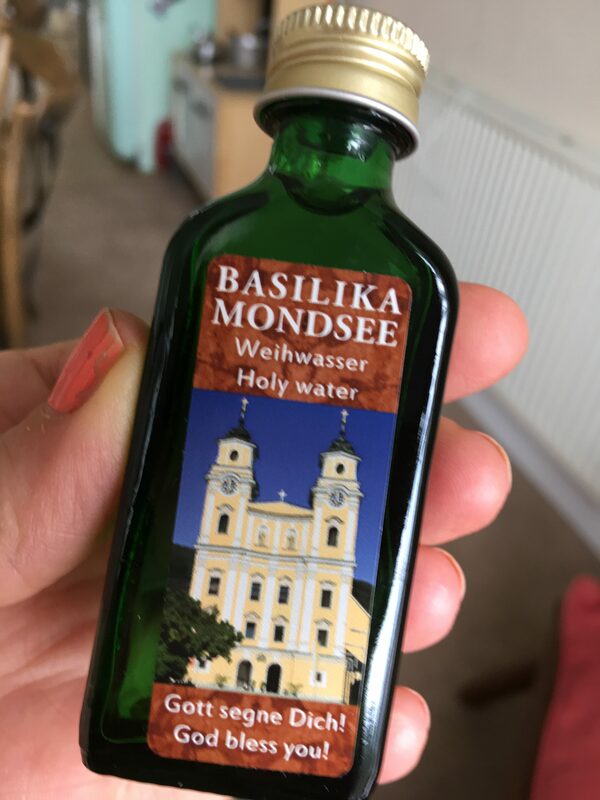 I also loaded up on some free bottles of holy water; these would make great little gifts for Catholic friends and family. But wait! What did that say on the side? Jagermeister? How did that happen? 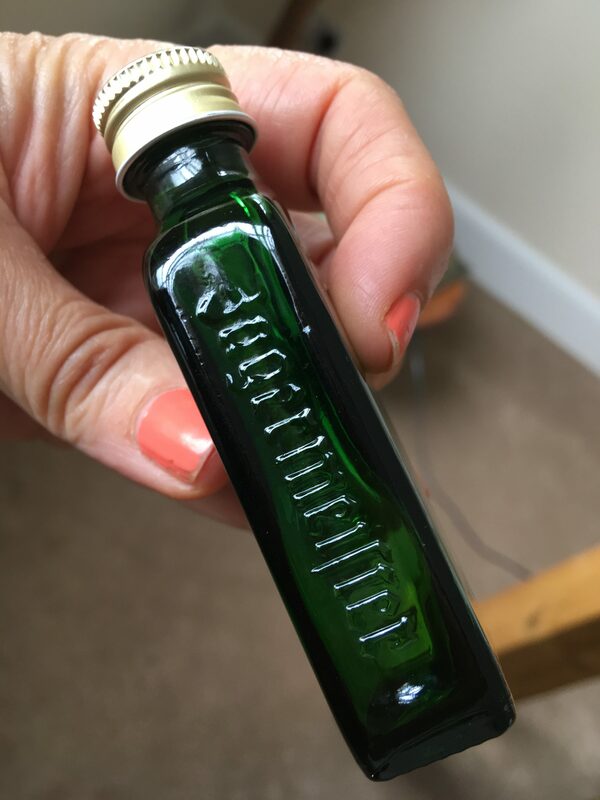 There were hundreds of these little bottles. Did Jagermeister donate empty bottles? Or was it “holy water” (wink wink)? 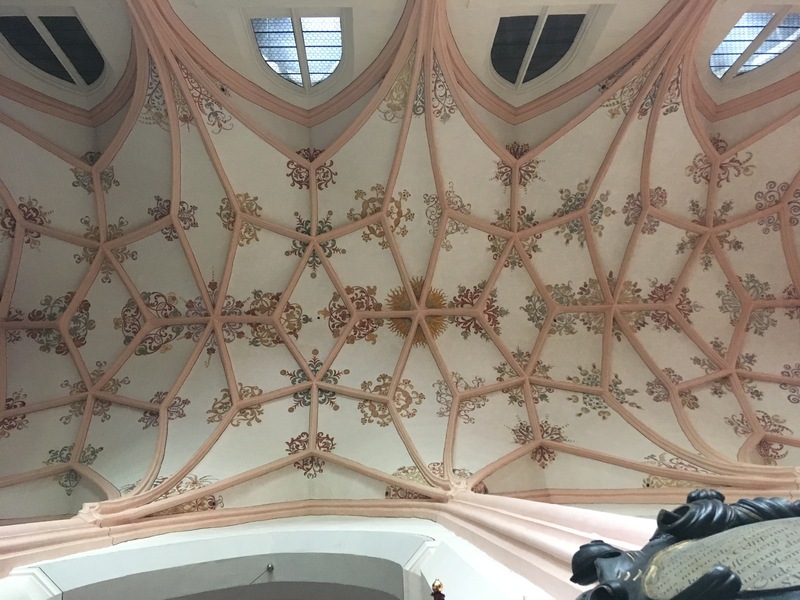 Maybe the church paid the local teenagers to drink all the Jagermeister, then fill the bottles with holy water? If so, I wondered if the maker of Jagermeister knew that their brand name was being used for purposes not originally intended? 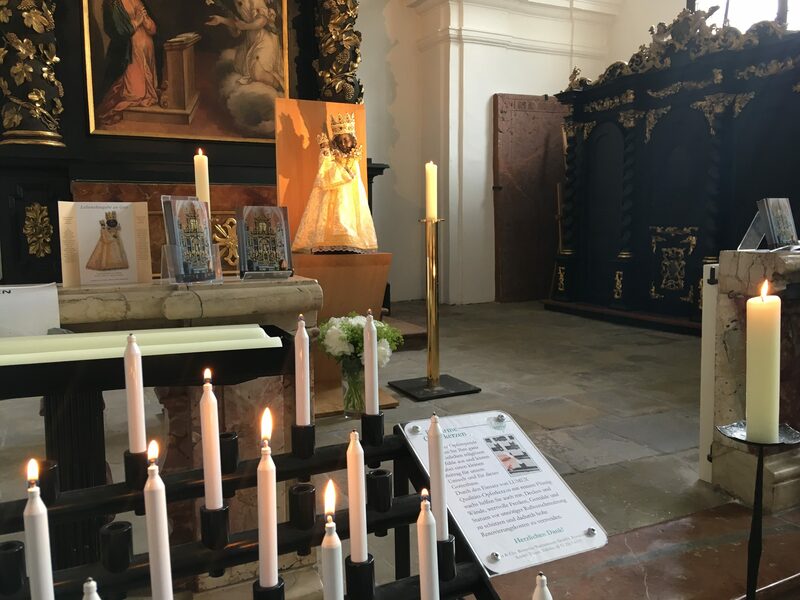 This entry was posted in Adventure, Budget travel, Culture shock, Joie de vivre, Living abroad, Travel and tagged Austria, Salzburg, travel on July 12, 2017 by Breaking Free.